There are statues and sculptures aplenty in Luxembourg Garden, including replica of the Statue of Liberty. Random information of the day: the Statue of Liberty is French by nationality, designed by Frédéric Bartholdi and brought to life by Gustave Eiffel, who was assisted by Maurice Koechlin. The completed statue was disassembled and shipped in crates across the ocean before being reassembled – the latter took some six months for the erection to be completed. Back to the sculpture above. Named “Faune dansant” (i.e. 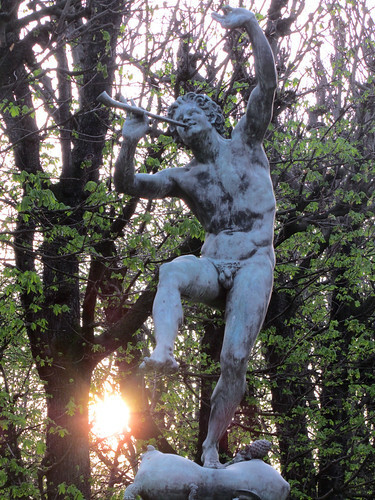 dancing faun), this sculpture of merriment and music can be found close to the site of the Medici Fountain in Luco. Despite the name, the depiction is really that of a satyr rather than a faun, which is half goat, half human. In mythology, satyrs are pipe-carrying and dance-loving creatures. Looking at this sculpture, I half expect woodwind tunes to fill the air, so I can close my eyes and twirl to the melody. Day 83: Perspective Day 85: Say cheese!